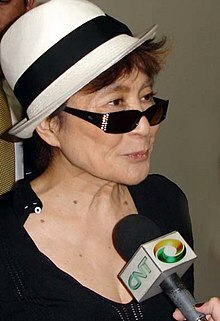 Yoko Ono (小野 洋子, Ono Yōko, born February 18, 1933) is a Japanese musician and artist. She is the widow of John Lennon. Before she married Lennon she was married to Toshi Ichiyanagi from 1956 to 1963 and Anthony Cox from 1963 to 1969. She has two children, Kyoko Chan Cox (with Cox) and Sean Lennon (with Lennon). Both of her parents came from wealthy families. Her father, who was a descendant of a former Emperor of Japan, had been a concert pianist, but gave up music to become a banker. Ono was tutored privately, then sent to exclusive private schools, studying classical music and art, and also learning English. She visited the United States before World War II with her family. Her father was on a business trip to the U.S. when the war began, and was detained with many other Japanese in the country. He was not able to communicate with his family for many years. Ono's mother took her, her brother and sister away from Tokyo, and they stayed in a rural area. After the war ended, the family was reunited, and moved to New York for her father's job. Ono enrolled in Sarah Lawrence College, but quit during her third year. She became interested in avant-garde art and music, and began writing poetry. Many of her poems were instructions, for creating pieces of art. She later published some of these in a book, titled Grapefruit. Her parents were not happy that Ono chose to make her own way, rather than following her family's wishes for her life. When she married Toshi Ichiyanagi, a young pianist, her parents disowned her. The marriage did not work out, and Ono rented a loft apartment of her own. She became friends with local artists in New York, including Andy Warhol and a group called Fluxus. She hosted small parties and "happenings" for her artist friends, and began to do artwork of her own. This brought her some notoriety in time, but not fame. She remarried, to Tony (Anthony) Cox, and they had a daughter, named Kyoko. Ono went to London with Cox and Kyoko during 1966, to promote her career as an artist. John Lennon, who was a member of The Beatles, went to one of her art shows. He enjoyed the surreal (fantasy-like) quality of her work. Ono and Lennon became friends, and later lovers, as each lost interest in their spouses. Lennon wanted them to be together as much as possible. He broke a rule the Beatles had never to bring a wife or girlfriend to their recording sessions. He brought her along anytime he could. They were married in March 1969, after they were both divorced. Many Beatles fans blamed Ono for "breaking up" the band through her influence on Lennon. He seemed to many people to have "gone crazy" since meeting her. Some suggest that Ono simply encouraged Lennon to do things he'd already wanted to do, but let himself be talked out of doing in the past – including quitting the Beatles. Ono and Lennon started a new, part-time group they called the Plastic Ono Band. They also tried to have a baby together. Ono miscarried several times, until their son Sean Lennon was born in 1975, on Lennon's 35th birthday. Ono was also able to reconcile with her family, during the 1970s. Ono was Lennon's "muse", inspiring his music and his creative side, for the rest of his life. The two worked together on both his post-Beatles records, and Ono's wish to also have a music career. She was more interested in "experimental" music than in classical or popular music. Ono's songs and unique style sounded strange to most listeners. It was offensive to many people, who thought Lennon should have either stayed with the Beatles, or made more music in their style. Ono changed her style, and began to write and record more pop songs, but her music never became popular. Years later, some younger musicians (such as The B-52's) admitted they had liked Ono's music. They were inspired by it, as Lennon had been. After Lennon's death in 1980, Ono recorded several solo albums. The first was titled Season of Glass. Her later records were praised by some music critics. They were even enjoyed by some Lennon fans, but the albums never sold well. Ono gave up her own musical career, and became the "caretaker" of Lennon's estate (the things he left when he died) and his non-Beatles work. When Sean Lennon grew up, he also became a musician. He helped Ono to compile (collect and put in order) her old recordings, and make some new ones. She also revived some of her earlier artwork, and gave the money made from sales and exhibits to charities. Ono recently (2006) appeared at the opening of Love, a Cirque du Soleil show featuring Beatles music, to help promote it. This page was last changed on 2 January 2019, at 03:20.